On one occasion – when playfully challenged by JB in informal testing – Hubert guessed 25 of the ESP cards correctly in a row in what JB says “was the most phenomenal thing that I have ever observed.” Hubert’s biggest contribution, however, was his participation in the well-controlled Pearce-Pratt series of clairvoyance tests conducted over various distances across the Duke campus in what is often cited as the most conclusive evidence of ESP of its time. 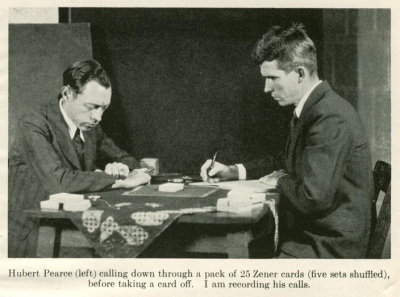 In this series conducted between August 1933 and March 1934, Pearce was located in a library cubicle where he recorded his guesses of the order of ESP cards that were managed by Gaither Pratt in another building, first 100 yards and then later 250 yards away. Pearce made his guesses on a synchronized schedule as Pratt set out the pre-cut and pre-recorded cards one by one; afterwards both men sealed and delivered their records directly to JB Rhine, then later met to check the results. Altogether Pearce scored 558 hits out of 1850 trials (where 370 would be expected by chance), with astronomical odds against chance of 22 billion-to-one. My father, Hubert Pearce, was a pioneer in ESP research at Duke University back in the early 1930’s. Sadly, he never talked about it with me, about which I will speculate a bit later. We did visit Duke in the late 1950s when I was in junior high school, and later in the early 1960’s we were visited in our hometown of Paris, Arkansas by Gaither Pratt who had been my father’s original experimenter in the Pearce-Pratt series. My father came to Duke Divinity School back in the 1930’s to be a Methodist minister, after he had graduated from Hendrix College in Arkansas in high standing where he majored in Biology and English Literature. My father’s cooperation with Dr. Rhine was not coincidental. After hearing JB Rhine speaking at the Duke School of Religion about the ESP research, my father told Dr. Rhine that his mother had some psychic experiences and he had witnessed some of them. My father had grown up in Clarendon, Arkansas, which is on the White River. His mother was very clear that he was never to swim in the river as that was very dangerous. But one day he and some friends were playing on the edge of the river a long way from his home and decided to swim in the river. Just when he was getting ready to get in the river, his mom appeared and told him not to get in that river. How did she know that he was getting ready to go in the river?? He also reported that he saw his mother once put her fingers on their kitchen table and some men who were present were unable to lift the table. When Dr. Rhine asked my father if he possessed these same capacities, he is recorded as responding, “Yes, but I’m afraid of them.” Dr. Rhine assured him that he had nothing to fear from controlled laboratory experiments and he agreed to become a subject. His scoring turned out to be very high over a fairly long period of time, and eventually led to his participation in the Pearce-Pratt series of tests. Some time after the Pearce-Pratt tests my father did lose this ability to score well on the tests, and this happened very suddenly. It seems from all reports that he had received a “Dear John” letter from a girlfriend, and this abruptly ended his ESP abilities and therefore any further participation in formal ESP tests. When Gaither Pratt visited us and tested him again in the late 1950’s he failed to show any sign of the earlier special ability, and old letters indicate he never regained it again. As to the after-effects of his work in the ESP tests at Duke, well, it almost prevented my father from becoming a Methodist minister. Even though he had a degree in Divinity from Duke University, back then the process for becoming a Methodist minister involved an extensive interview by a committee of ministers. One negative vote would prevent a person from becoming a minister. One of the reviewing ministers commented that he considered voting “no” because my father had studied biology and psychology. Over his years as a minister I never heard my father speak about his own special performance in the ESP tests at Duke. I think he was worried that if he talked about his ESP work that some of the people in his church, other ministers, or District Superintendents might consider this to be a serious shortfall. Hugh reports that when he was on vacation with the family back at Duke he met Dr. Rhine, whom he described as a “big man who excludes mental warmth. It was like walking into a room with an oven on.” When he met Dr. Rhine, he was told “You’ve got a pretty famous father here,” but Hugh just didn’t believe it at that time about the ESP experiments, probably because he hadn’t been told about it from our father. It turns out that he hadn’t mentioned it because he did not want his kids to talk about it to their friends. Also, the towns he preached in were small and superstitious and he didn’t want people to think he was raising demons. He was afraid it would hamper his ability as a preacher and his efforts to reach out to them. I would describe my father as a very calm, peaceful person, and, as my brother notes, a kind and gentle father. He was like most anyone you would meet in a small town. His father was a plumber in Clarendon, which is a very small town in eastern Arkansas. Today its population is still less than 2,000, and it does not have any stop lights on the streets! Two of his brothers became plumbers and one was a civil engineer. His primary hobby was photography. We always had a dark room in our house, where I started spending time when I was in the 6th grade. Sadly, he didn’t save very many pictures. In one very small town he lived in after I graduated from college, he took all the pictures for the school yearbook. We also had a wood shop in the garage where he used to make some furniture. I’ve always wondered but never knew what motivated my father to be a Methodist minister. When he graduated from Duke in 1934, Professor McDougall, who was the head of the psychology department at both Duke and Cambridge University in England, wanted him to go to Cambridge to get a Ph.D. in psychology, but he said he wanted to become a minister. And subsequently he did serve as a minister in several small Arkansas and Missouri towns, and, as my brother notes, he was to Arkansas Methodists a hard-working popular minister. One thing about his role as minister was that he came to be considered a church builder by the Bishop, and we would be moved to a town that needed literally to rebuild or replace the church. In 1953 he realized a lifelong ambition of designing and building his own church; this was in Bentonville, Arkansas, and it was considered to be a classic, traditional church design, and it won an award for its design. Another large church had some significant changes made to it just before we moved there, but when Dad reviewed the drawings, it was clear that the builder had failed to do a lot of the work in the drawings. When the builder tried to evade these problems, Dad had no problem showing the builder the specific things that were not done. The builder became unhappy! Upon my return from a trip to Durham and Washington I found your interesting letter. I will have to admit that it is a new approach and I wish that I might have had it to send to Dr. Rhine. Of course, you realize that it isn’t deserving of a respectable reply. There are a lot of things that might be said to express my opinion of it–and probably of you. May I say simply that I am as much interested in the project now as I was when I was in the University and the longer I live the more I become convinced of its reality. Those of us who have worked with Dr. Rhine have never once doubted his ability as a scientist and research director, his devotion to the Truth, his brilliance, or his integrity. You are simply beating again the path that was beat by Experts in the 1930′s. The day will come when Dr. Rhine’s name will be among the Immortals — and the name of his critics forgotten. Although Hubert Pearce did not speak openly about his ESP work back in his hometown nor to his sons in their early years, it is clear from all reports and his continuing correspondence with my father JB over the years, that Hubert Pearce continued to feel proud about this work in which he played such an important role. He and JB remained close friends and mutual supporters for many years ahead. This entry was posted on October 8, 2013 by rhinemageditor in ESP, Parapsychology, Psi, Psychic, religion, Rhine Research Center, science and tagged Duke University, JB Rhine, psi, psychic ability, Rhine Research Center.